A great way to promote your company or encourage people to attend your eventis to hold contests or raffles for fun and useable prizes. One of the most traditional ways to hold contests and raffles is to give out numbered tickets. One ticket goes into the "hat" for the drawing, while another ticket with the same number is given to the person who paid to enter the contest or raffle. The biggest challenge is that a small ticket is easy to lose. Contestants place the ticket in their pocket or wallet, only for it to fall out and become lost. This predicament does not happen with numbered wristbands. Numbered wristbands feature single or multiple tear-off tabs for contests, raffles, redemption, pre-payment methods and more. Let's say you're hosting a raffle at an event to promote your business. You can distribute serial numbered wristbands with pull-off tabs to each participant. They're easy to use and fun! Each person who purchases an entry to your raffle gets a wristband to wear and removes the detachable stub, which serves as the ticket stub. The stub is entered into the raffle. When the winning numbers are announced, each person just checks the wristband worn around their wrist. No digging in pockets, wallets or purses for aticket. There are a couple of different styles for numbered wristbands. Wrist-Rider® wristbands offer multiple tear-off tabs: three, four or five. This is ideal if you are hosting a raffle in which your guests can pick and choose which prizes they want a chance to win. As an example, let's say you have a total of ten fabulous prizes.One of the prizes is a $200 shopping spree at a local boutique, while another is a $100 gift card to a French restaurant. One of your guests is excited about the shopping spree, but not a fan of French food. She can take one of her five stubs and enter it into the drawing for the boutique and pass on the drawing for the French meal. The same guest can pick and choose which of the other remaining eight raffles she wants to enter with her other four numbered stubs. You can also use numbered wristbands with multiple tear-off tabs as a pre-pay method for food, drink or rides redemption. Oftentimes breweries have tours to show how they create their special brew. Afterward, guests get a certain number of beer tastings. Numbered wristbands are ideal. Each tab can be numbered, 1 through 4, for example, and for each sample redeemed, the bartender tears off the appropriate numbered tab. Easy! The Securband® Plus and SecurMatch® numbered wristbands have a single pull-off tab with a matching serial number. Not only are these great for raffles and contests, but also claim checks and even child/parent match-ups. The Securband® Plus numbered wristbands are economical, comfortable and tear resistant with a strong adhesive closure and unique tamper cuts that cause it to shred if tampered with—making it good for one time use only. So, it a great choice for a one-day event. SecurMatch® numbered wristbands, on the other hand, are made for multi-day use. They are waterproof and durable with a locking, single-use, plastic snap to prevent transfer. This numbered wristband style is a great choice for resorts or camps where guests plan to stay a few nights and participate in outdoor activities during the day. All of the numbered wristbands come in a variety of vibrant, solid colors to add a little fun to your contest or raffle. If you want to add some flair to your numbered wristbands—and perhaps even entice participants to take some sort of action—try custom printing.Maybe you can have a logo and invitation to your store imprinted on the numbered wristband itself, while a redemption valueor coupon is imprinted on the tab, such as "20% off!" Whatever kind of contest or raffle you are holding, numbered wristbands make it easy because the redeeming stub is right on the winner's wrist.No missing out on prizes! To really make a strong impact with participants, it's a great idea to imprint the company and any sponsor's logos on the numbered wristbands—powerful branding indeed. In fact, it's just like a walking billboard. Their friends will ask questions and the answers will only be positive. 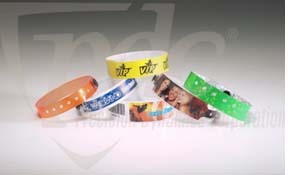 Nothing is better than word of mouth advertising, and numbered wristbands used for raffles and contests make that easy.